The morning was crisp and unusually cool for April; perfect for a morning hunt. As they trekked to their stations, pairs of hunters were enveloped in a darkness intensifying the sounds and smells of the sleeping woods. As the sun began its slow creep into the morning sky, some were greeted by wildlife they had never seen in person—bald eagles, sika deer and skunks, all stirring at the first signs of dawn. The excitement and nerves were palpable, ratcheting higher as the sounds of the woods came alive. Hunters listened intently to the eerie sika bugle in the distance, the everpresent scratching of squirrels, birds fluttering between branches and finally, the reason they all woke up early: that first morning gobble. For 14 individuals, this was their first early morning walk into the woods with one task in mind: to hunt wild turkey. Made possible through a partnership between the Maryland Department of Natural Resources, Maryland State Chapter of the National Wild Turkey Federation and U.S. Fish and Wildlife Service, this First Shot Mentored Turkey Hunt was the first of many through a new Mentored Hunt Program. The goal? To introduce newcomers (and welcome lapsed hunters) to learn a new set of hunting skills. From the moment someone is selected into the program, they are paired with a skilled veteran hunter to mentor them. The mentor and mentee are then able to meet in person or correspond to discuss any questions or concerns either of them may have. Trainees enjoy a series of lectures on firearm safety and hunting strategies. The program also provides range time for them to hone their skills before foraying into the fields and forests. Throughout the program, staff and partners contribute their collective resources and knowledge to make it as encompassing as possible. Mentors and partners all work to ensure that each and every mentee is prepared to embark on their journey into hunting on completion of the program. Some may question the necessity of a Mentored Hunt Program—isn’t hunting an American tradition, passed down from generation to generation? Isn’t wild game the ultimate field-to-table food source—local, humane, organic and sustainable? It was, and still is. Research indicates that such factors are absolutely crucial to wildlife conservation management. A recent U.S. Fish and Wildlife Service survey showed that fewer than 5 percent of Americans ages 16 and older actually hunt. This figure has dropped by more than half in the past 50 years and is not showing any signs of reversal. More than half of hunters are over 45 years old; 38 percent of those are over 55 years old. Many hunters hang up their boots as they begin to age, and fewer young people are taking up the mantle. It is essential that hunting lives on—not only as a cultural tradition, but as an invaluable conservation tool. Hunters spend approximately $26 billion a year, a large portion of which is distributed to state wildlife agencies. A decline in hunters means a decline in funding, spelling serious trouble for the sport as well as other management activities. Conservation agencies depend on funds generated from license and stamp purchases and excise taxes on firearms and ammunition to manage all wildlife, not just game species. In order for this trend to reverse, agencies must bring new hunters to the sport. Women are grossly underrepresented among hunters, making up only 10 percent. Additionally, 97 percent of all hunters are white, and the majority has a median household income of $40,000-$100,000. For these reasons, the department supports programs like Archery in the Schools, Becoming an Outdoors-Woman, Junior Hunter Field Days and these Mentored Hunts to help introduce people from all walks of life to the hunting community. From just one weekend in April, the First Shot Turkey Hunt produced 14 new hunters. Every participant was able to see, hear and experience things they never have before. To call it a success would be an understatement. The goal of the program is to make a hunter—not just one who can harvest an animal once, but one who is set up for a lifetime of hunting success. The quality of the April program was evidenced by the participants’ excitement and enthusiasm, as well as the sheer joy on their faces. 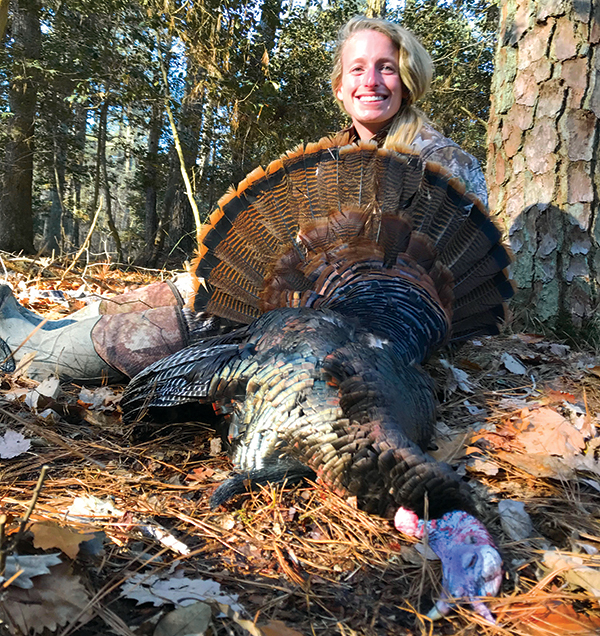 Four birds were harvested that weekend, but, most importantly, more than a dozen Marylanders made lasting memories with family and friends, and joined a time-honored community. By year’s end, the First Shot Mentored Hunt Program will have hosted two more hunts: deer and dove. The department welcomes any and all participants to join in this incredible opportunity. Article by Christopher Markin—hunter recruitment, retention and reactivation coordinator. Appears in Vol. 21, No. 4 of the Maryland Natural Resource magazine, fall 2018.